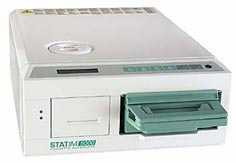 Cassette (inside dims): 7" x 15" x 3"
External dims: 16.25" x 21.7" x 7.5"
The new StatIM G4 Series has replaced the original StatIM systems. "Classic" models are no longer available. Click Here To Check Out The New StatIM G4 Sterilizers!